As you already know, Castello is a hamlet on the hillside above the village of Valdottavo, which is itself some 16k north of the city of Lucca. 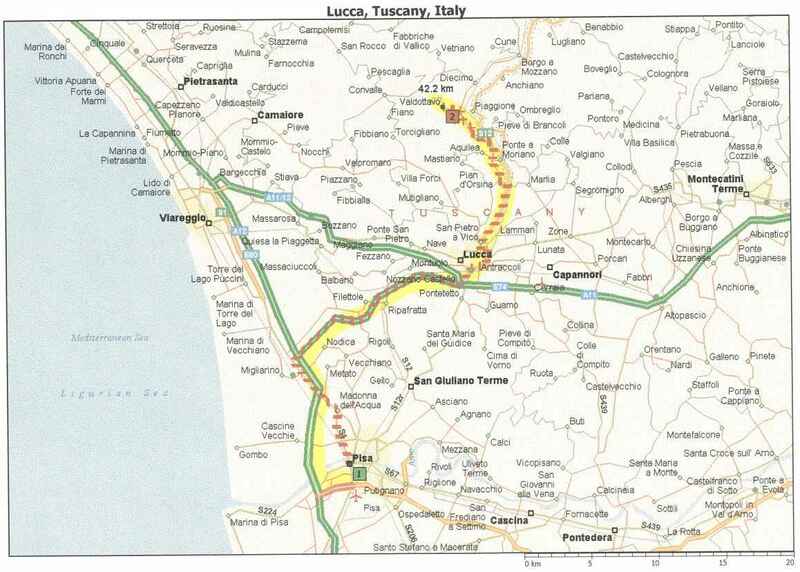 The excellent Italian motorway system (signs always in GREEN) serves Lucca from Genoa (Genova) to the north-west, from Florence (Firenze) to the east, and from Pisa to the south. Wherever you start from, Lucca is the key to finding Castello. From Galileo Galilei airport, which is just south of Pisa (very close to the Pisa Central exit from the A12 motorway), your easiest route to Lucca will by the A12 motorway. Follow the A12 in the direction signed for GENOVA (do not worry that it is also for Livorno at first). At the PISA NORD junction take the A11 motorway for FIRENZE. Do not go into Pisa Nord. Continue until you reach the LUCCA exit. If you want to stop in Pisa to visit the monuments you must avoid the motorway, and instead follow signs in BLUE for Viareggio from the airport. The road system in central Pisa can be confusing, but the centre is well signed. 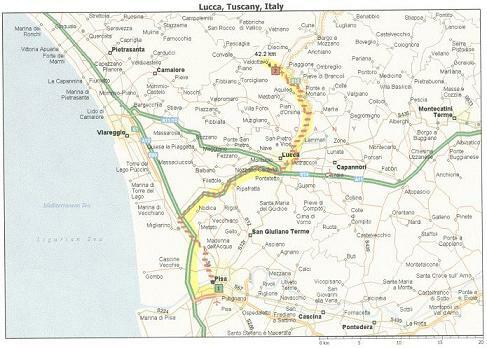 When you leave you will have to go via the SS12, which is the main non-motorway route to Lucca. If you have driven on the French motorways you may be wary of the tolls payable on exit. In Italy the tolls are much lower. From Pisa to Lucca is only around £2 sterling. The A12 motorway runs from LIVORNO in the south to GENOVA in the north. Connecting with it at Pisa Nord is the A11 which leads east to Firenze, via LUCCA. The Lucca exit is well marked and you will quickly find yourself approaching the walls of the city from the south. The walled city of Lucca is closely encircled by a road system which you will need to go round until you leave it to go north on the SS12, direction ABETONE/GARFAGNANA. It does not matter whether you go round the ancient and magnificent walls of Lucca to the east or the west - it is a fine sight which you will anyway want to revisit. 8k after leaving the walls of Lucca you will come to a major intersection just before PONTE A MORIANO. The Esselunga Supermarket is on your right (you may want to visit it for basic supplies...). It is simplest to by-pass Ponte a Moriano by turning left at the roundabout. 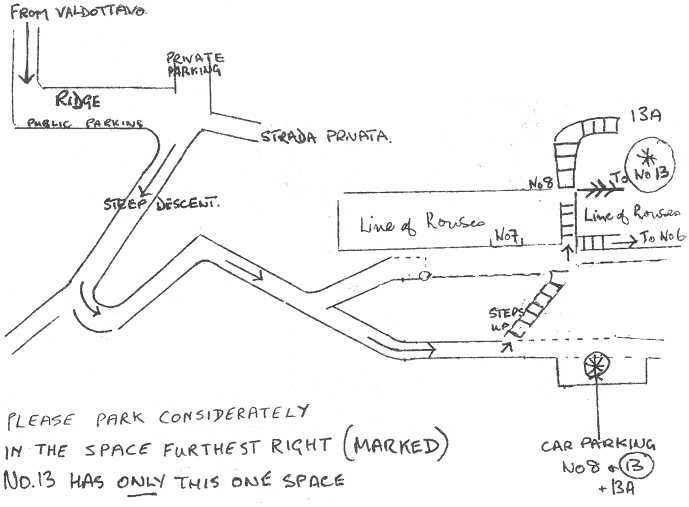 You will pass through three tunnels and then, after a further kilometre or so, bear right (signposted to Borgo a Mozzano) and cross back to the left hand side of the Serchio via the new bridge. Immediately past a large and ugly paper factory, turn left at the roundabout for VALDOTTAVO. A wise navigator will glance at the mileometer as you turn. The lane up to Castello is to the right, exactly 1.3k along the Valdottavo road. The turning is signposted but comes suddenly, and the sign is on your right, hidden by a house until you are on top of it. The blue sign gives a long list of places, including Castello; most are only a couple of houses! If you arrive in the village of Valdottavo - village square on your right - you have gone a couple of hundred yards too far! Do not be too daunted by your first drive up the hill from Valdottavo to Castello! In no time at all you will be up and down it as to the manner born. Follow the narrow winding road (mostly single track but there are passing places!) uphill for 2.5k until you arrive at a ridge where there is a flat area on which you may find one or two cars parked. The road then makes a very sharp right hand bend down hill, followed by an even sharper left hand bend; both may well require '3 point turn' tactics depending on the size and lock of your car. After these two hairpins the road runs straight along the bottom of the village. The attached detailed map of Castello shows where to park - about 100m from the final bend, on your right - and how to find your way up to the house. The key will be in the door. Please do not arrive before 3.00pm since Giorgetta needs time to clean the house and make up the beds for you after the previous guests leave. 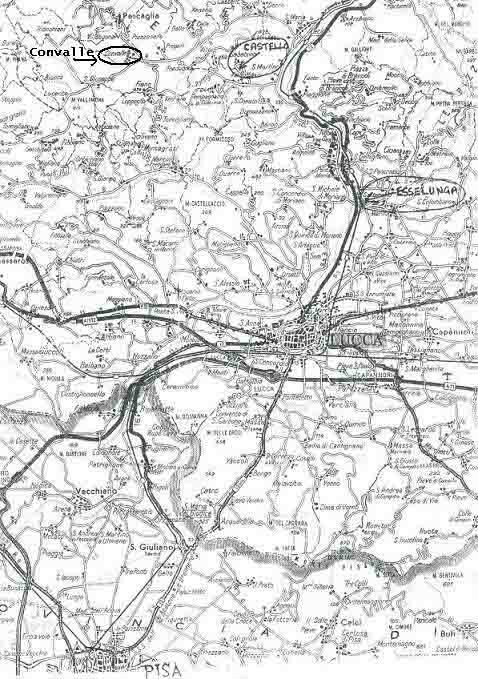 Except on motorways, garages are closed from 12.30 to 3.30pm and are not generally open on Sundays. It is also best to assume that only motorway garages accept credit cards. Many have a machine which will dispense fuel after you have fed in euro notes, when there are no staff. These machines are not easy to understand but do in fact work function well. It is easiest and wisest to shop at the ESSELUNGA supermarket on your way from Lucca (marked on the attached map and quite impossible to miss, at Ponte a Moriano). It is open until 8.30pm on Saturdays, and Sundays, but not on Monday mornings. It has all you need, but does not take all credit cards. Remember that Italy is a cash based society. Valdottavo has several shops but they are not open on Sundays. Banks are closed on Saturdays and the nearest one is in Diecimo. You will find detailed notes about our house, trips and walks you may like to take, local restaurants and sites of interest in a folder in the house. Our friend Anna Galli represents us at Castello. Although born in Scotland, her family home has always been just up the valley in Partigliano, where she lives with her Scottish/Italian father and Italian/Scottish mother! She is bilingual and knows everything there is to know about the area, its pleasures and amenities.We are in regular contact with her and have total confidence that she will act just as we would to make your stay as enjoyable as it should be. Anna will visit you at 10.00a.m. on the first Sunday of your stay unless you request otherwise. Do make use of her knowledge and ask her about any domestic or local matter on which you are not sure. She will be happy to call again the following Sunday if you are staying for more than one week and will check whether you would like her to do so when you meet her. Should you have any problems during the week Anna's telephone number is (0039) 0583 835038, mobile 340 5304196, and she will always respond effectively to a call for help. Mobile telephone reception is now pretty good, especially from the terrazza — provided that you are set up to 'roam'. Alternatively there is a public telephone in the 'war memorial' square in Valdottavo — phone cards from the tabacchi in the village. A few other houses in the village are in English ownership and may be let to holiday guests. Some may have been to Castello in previous years and it might well be worth picking their brains for advice on restaurants, interesting places to visit and so forth. A final tip: do call in at the Esselunga supermarket (see map) on your way to Castello to save the bother of having to go back there as soon as you have arrived. Whilst the previous guests may have left such useful items as washing up liquid, they may not — so make sure that you have essentials like toilet paper, soap, matches for candles or a fire...This will ensure that your first hours in Castello are as delightful as they should be. Please do not arrive before 3.00pm. Your key will be in the door.